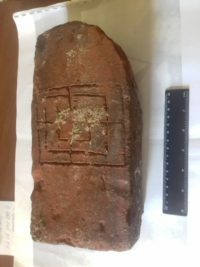 Archaeologists excavation the Vyborg Castle in Russia’s Leningrad Oblast near the border with Finland have unearthed a brick that was used as a game board in the Middle Ages. It appears that the game grid was engraved on the brick before it was fired. The brick was discovered in an underground passage in the northern section of the castle that connected the storehouse to the moat, and may even have extended all the way in to the city of Vybord. The game board is for a game named tablei, which translates to “mill,” was similar to a Nine Men’s Morris. Two players with nine pieces each, one side black, one white, faced off over a simple grid. In the game, each player aims to claim the other’s men, much like the pieces in chess. When a player builds a “mill” — a row of three men—on the grid-like board, they are rewarded with an opponent’s game piece. Once a player is down to just two men, they are unable to form mills and their opponent claims victory. Located on the Finnish border with Russia, Vyborg Castle was built in the 13th century and extensively renovated in the 16th. It began to fall into disrepair in the 17th century and switched hands between Russia and Finland several times before being annexed by the Soviet Union in 1944. Neither the USSR nor the Russian Federation did much in the way of upkeep of the once-vital strategic stronghold and its city. This is the first time a thorough, dedicated archaeological excavation has been done at Vyborg. Before then there were only small-scale surveys accompanying basic construction and repair work. The dig has been exceptionally fruitful. 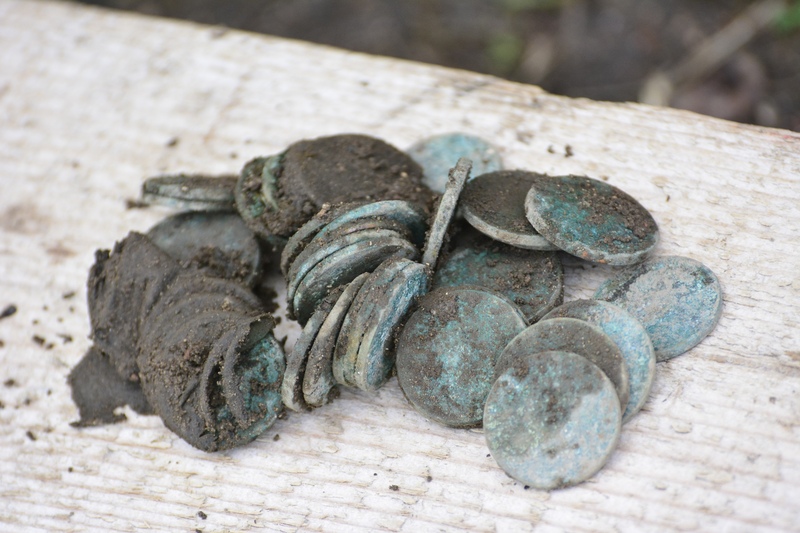 Last month archaeologists found a bag full of 38 two-kopeck coins dating to the reign of Tsar Alexander I (1801-1825) under a parapet wall. They have also laser scanned the underground passage and made a 3D model of it. This entry was posted on Thursday, September 6th, 2018 at 11:16 PM	and is filed under Medieval. You can follow any responses to this entry through the RSS 2.0 feed. You can skip to the end and leave a response. Pinging is currently not allowed. “Mill” in Russian is ‘МЕЛЬНИЦА /’melnitsa/, so is the name of the game (words in English and Russian share the same root /mil-mel-/). For “tablei” check out Wiki Tafl games. In medieval Russia ‘ТАВЛЕИ /’tavlei/ “tables” was a name for a board game of Greek origin similar to checkers. PS — The Northern Crusades lead to “Danish Estonia”, until in 1346 Estonia was sold for 19 000 Cologne marks to the Teutonic Order (i.e. 4448 kg of gold? ), and ‘Elleholm’ in what is now Sweden (where the Venetian gold coin from the last post had been found) was back then Danish. This looks like a board for an old viking game called kings table?